Been enjoying cooking on this griddle for over 25 years. Not sure if Coleman even makes it anymore. Minimal butter or oil is needed to keep eggs from sticking and has been perfect for eggs, pancakes and French toast. Picture is from this past week-end and shows plenty of room for 5 over easy and 1 sunny side up egg along with sausage patties. Note: No picnic tables or plastic table cloths were injured during the making of this meal. I like my Coleman gas stove and cast iron griddle. Throw on some scrapple, hash browns and a couple eggs. No doubt a cast iron griddle is the way to go ! Non stick, easy clean up ! Just the wife and I we use this small griddle for everything ! 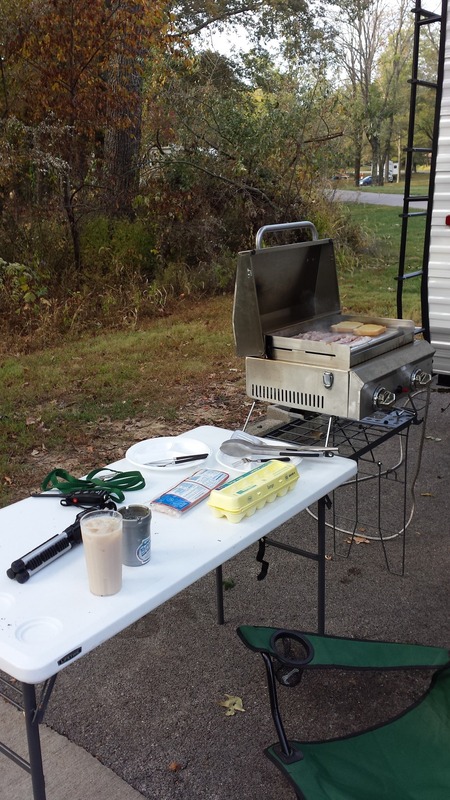 Nice grill setup Butch Wilson! I've been tempted to try a gas grill like that. As much as I like my gas stove, I have a hard time keeping a low flame. I am searching for a one or two burner stove for making coffee that will use the low pressure quick connect. How is the coleman ? 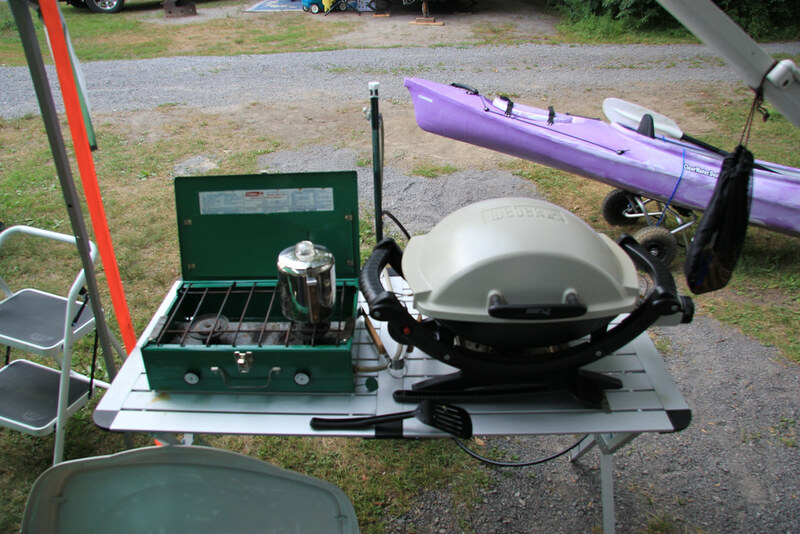 The grill works great, it came with the camper ! The Coleman is nice but it's a three burner and as far as I know I can't use it on the low pressure connection because I can't find an adapter that would allow me to connect directly to the stove without the regulator it came with. The Coleman stove (model 5423B701) was purchased by my folks in 1982 when Dad and the rest of us were posted back to Canada from Germany. When Mom and Dad stopped camping in the eighties it came to me. Now it gets faithful use and a yearly disassembly. Second year with the Coleman Grill. First time I used the Camco Grilling Table.